Looking for a Vacation Property to Buy? Have a Vacation Property You Want to Sell? Denise Leonhardt is the broker and co-owner of NB Leasing & Resorts, along with her husband Curt. Denise has more than 25 years of real estate sales experience in Houston and the New Braunfels areas. She is tenacious and detailed in her work and loves to bring buyers and sellers together to make a successful sale for all parties. 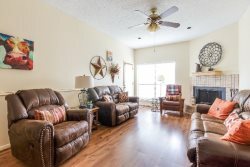 She has helped many of our Winter Texans find a vacation condo of their own in this area and has helped many other investors find that perfect vacation property they can both enjoy and rent as a vacation home. Denise and Curt live in New Braunfels and want to help others find that perfect investment in this beautiful area.